We at Cobb Lumber know how important it is to keep things where they belong, especially on the banks of bodies of water. To ensure that you don’t lose granular inventory to the forces of nature, we provide a number of products, including silt fencing, straw and excelsior wattles, and straw and excelsior blanks to prevent erosion losses and landscaping degradation. You can count on our erosion control products to protect your property. Learn more about foundation piling. When Storm Water Permits require Best Management Practices (B.M.P.s) be used on your job or property, you can have confidence that Cobb Lumber has the products to meet the need. Wind and rain can seem to conspire to rob you of these vital materials needed for the job. The quantity of material lost to natural forces can add up to significant losses. Our products are designed to combat this, starting with silt fencing. We merge standard fencing with geotextile fabric to afford a barrier that lets the wind and water through, but keeps your valuable soil where it belongs. By providing an impassible barrier, your losses as a result of Mother Nature will be drastically reduced. 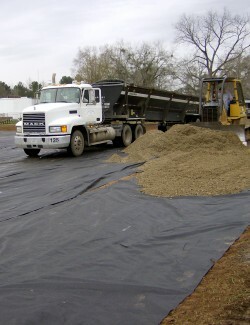 Our geotextile fabrics can also be utilized for terrain management and protection. The nutrient-rich top soil layer is highly susceptible to erosion until natural root growth provides a network that can prevent such loss of matter. The technology works because the natural permeability of our geotextile fabric will allow sunlight and moisture to reach your seedlings and growth will continue unhindered. At the same time, this product acts as a shield that keeps wind, rain, and unfriendly weather from young flowers and vegetation until they can hold their own. All of our erosion control products, silt fencing, and geotextile fabrics are guaranteed to thwart inventory loss and landscape devastation from the forces of nature. These high-end materials represent the latest in agricultural and landscaping technology created to help protect and further your private or business interests.